Visiting Paris? Come visit us! 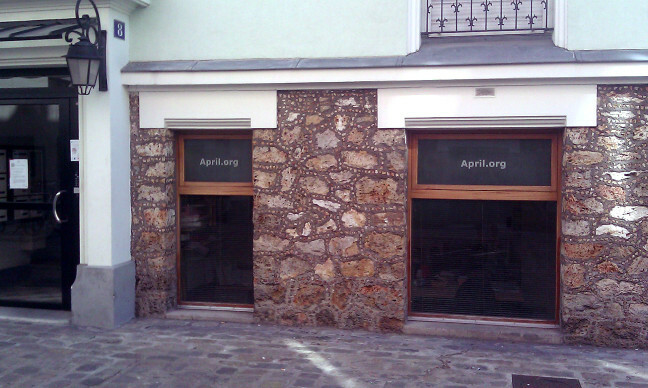 April has an office for its team of full-time employees and its members. If you're in Paris visiting or attending a conference, please feel free to come pay us a visit! Our office hours are generally from 9am until 6pm. If you'd like to come please let us know in advance you're coming. Send us an email to contact at april dot .org or contact us on our irc channel : #april on irc.freenode.org (webchat). Or contact April through the contact form. For press contacts, please visit our press page. For any request or information related to this website, please contact the website administrators. Under the French Data Protection Act (the “Informatique et Libertés” law of January 6th 1978), you have the right to access, modify, correct or delete personal data related to you. For any request, please contact us by email or by phone. April declared at the CNIL1 a “correspondent for the protection of personal data”, commonly called “Informatique et Libertés correspondent”. This correspondent is responsible for ensuring proper application by April of arrangements of the Data Protection Act (for more information, please visit the CNIL website. You can contact the correspondent by email or by phone.